I am reasonably active on social media. I love my blog and my blogging friends. I love Disney fans...but sometimes they make me want to scream!! Everybody has pet peeves, those little things people do that grind on your nerves like fingernails on a chalkboard. I know some of you will say, "Donna Kay does that really matter?" my answer to you is - to me it DOES. It's WALT Disney World - NOT Disney World. In Roy's words, as he dedicated the property at Walt Disney World's opening: "Everyone has heard of Ford cars. But have they all heard of Henry Ford, who started it all? Walt Disney World is in memory of the man who started it all, so people will know his name as long as Walt Disney World is here." They are Disney RESORTS - NOT Disney HOTELS!! Enough said. Minions, Bugs Bunny, Daffy Duck, Hello Kitty are NOT Disney characters!! There are other companies who produce animation, not all cartoon characters are Disney. But, Disney characters are the best!! Disney "Know-It-All"s - you know those people who know more that anybody else and have to LOUDLY make sure EVERYONE knows! People who think Disney is just for kids. Walt Disney said it best: "Adults are only kids grown up, anyway." Disneyland was built on the premise that kids, as well as their parents, should have place with they can ALL have fun. I am not juvenile because I love everything Disney. I love watching a Disney movie, with or without my kids/grandkids. My husband and I will be celebrating our 20th wedding anniversary in December at Walt Disney World. We will dine at wonderful restaurants with the finest chefs, stay at a world class resort, take a few tours to learn more about Disney and catch some shows. That doesn't sound childish to me. Online people/companies who insinuate they are Disney when they are not. There is one in particular on Facebook that continually has a "contest" to win an huge Disney World vacation - if they call it Disney World not WALT Disney World Resort they are NOT legitimate. 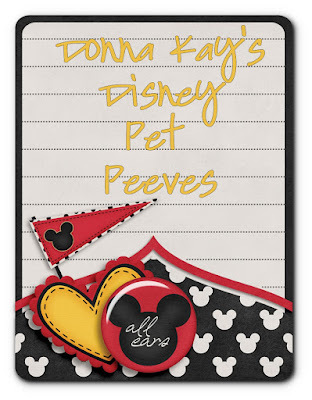 I would love to hear your Disney pet peeves. You can share them in the comments below, via Twitter or on my Facebook Page.